Our villa benefits from a large open plan living area, Dining table for 8, fully equipped kitchen with a separate area for a washer and dryer. There are 4 spacious bedrooms, one king with en-suite, one queen and 2 twin rooms, plus a family bathroom and separate downstairs pool bathroom. There is a free secured WIFI throughout the villa & pool area and a baby cot & high chair for the small ones We have a private swimming pool and spa and the outside space benefits from luxury patio loungers and furniture to ensure our guests can relax and take full advantage of the sunshine. We also have pool door alarms, so that you can relax with smaller childeren in our villa. 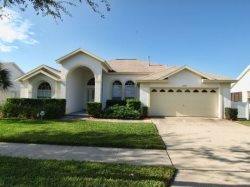 It is located in the gated community of High Grove and offers an oasis of peace and tranquility but with the added benefit of being 15 minutes from Disney and also close to other major attractions. There is also a family bar right outside the development and shops, bars and restaurants within a short driving distance. We are on a corner plot with a conservation area on one side and a beautiful view from the front. High Grove is a quiet gated community with Mediterranean style homes, there is a very welcoming clubhouse which has a fully equipped gym, games room, arcade room, plus a large swimming pool and hot tub. You will also find an ATM within the clubhouse. The development is maintained to a very high standard and there is also a children's play park on site.